What does it mean when a reviewer’s avatar is white with a dotted outline? What does not registered mean? 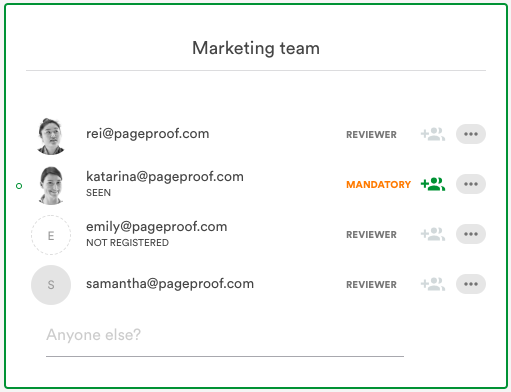 If you see a white avatar with a dotted line for an reviewer or owner, this means the user hasn’t completed their account activation in PageProof yet. Firstly, check that the email address is typed correctly – even the best of us can type too quickly and accidently add a typo. If the email address is correct, send the reviewer a nudge by clicking the ... icon to the right of their email address. This will prompt them to reviewer the proof. Note: on occasion the image of the avatar might be cached by your browser, it will change to a solid avatar after they register but you may need to refresh your browser.